The early 1980’s were very good to Rick Springfield. He had a Number One song with “Jessie’s Girl”, plus other hits including “I’ve Done Everything for You”, “Don’t Talk to Strangers”, and “Affair of the Heart”. And MTV wasn’t the only place where you could catch him on TV – he was also the fan-favorite Noah Drake on the soap opera General Hospital. 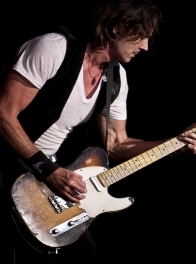 Although that was his period of highest visibility, Springfield has continued to act on the small screen (High Tide, Californication, True Detective, and a return to General Hospital) and the big screen (Ricki and the Flash), and to record music, most recently his 2016 album Rocket Science. And as we saw on Dave Grohl’s documentary Sound City from a few years ago, he can still rock out! 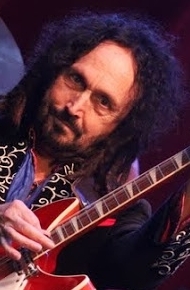 Mike Campbell is the lead guitarist for Tom Petty and The Heartbreakers, and is known for tastefully playing exactly what the songs call for – no more, no less. You’ve no doubt heard him on a number of Tom Petty songs, some of which he co-wrote including “Refugee”, “Here Comes My Girl”, “You Got Lucky”, and “Runnin’ Down a Dream”. Tom Petty and The Heartbreakers’ latest album, Hypnotic Eye, will be released in summer 2014. On the side, Campbell is the frontman for The Dirty Knobs, which plays lots of cool cover songs by the likes of Bob Dylan, The Beatles, The Grateful Dead, The Rolling Stones, and JJ Cale, plus plenty of amusing obscurities and original songs. This interview was done by phone on 4/9/14, and was for a preview article for the 4/18/14 concert at SOhO in Santa Barbara by The Dirty Knobs (L. Paul Mann photo).